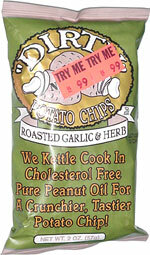 Taste test: These are very good potato chips, with tons of garlic and herb flavor and the nice crunch of a kettle-cooked chip. The irregular shape of the chips adds flavor and variety. Another winner from Dirty. Smell test: A nice garlicy, herby smell.